Ming Da MC300-ASE is 300B class A amplifier, with a unique mix of excellent circuit and high-quality power transformer, output transformer, tube rectifier,choke. It makes the reduction effect, ,the range of frequency response and the sound field of the timbres unique. Its machine appearance are carved delicately by Japan Fanuc CNC machining center and CN C lathes, having 6mm thick aluminum and aluminum shock apron. We select the following electronics components: valve using international famous Chech JJ brand, Tianjin all music 300B, Japanese imported annealed stalloy, oxygen-free thermostable pure copper wire, Danmark Jensen copper oil capacitors, imported silver plated signal wires, imported connectors, Japan ALPS potentiometer, exported high voltages electrolytic capacitor, aluminum made handle, whole hand scaffolding welding circuit, and imported acrylic shield. 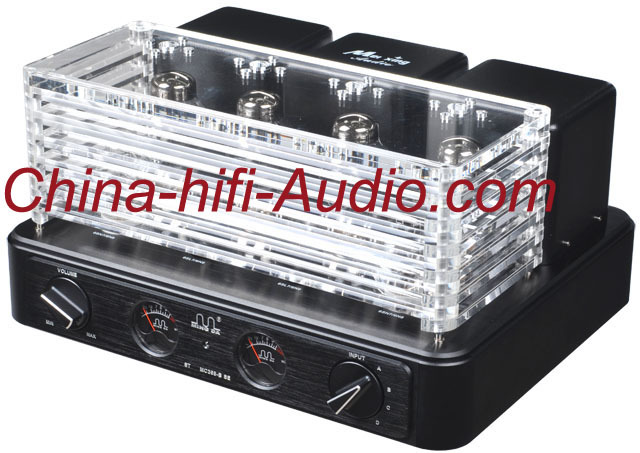 This amplifier is worth to collect for buyers. The amplifier feels good when enjoying vocal. It has a nice, soft, mellow and bright sound, and a real positioning sound field. It is equipped with Japan potentiometer, a remote control device,and the handle is made from aluminum shell.